Description of 'Why Israel?' Israel's military occupation of Palestine is horrifically reminiscent of South Africa's Apartheid past. Yet, pro-Israeli apologists are shocked that the Zionist entity is being compared to Apartheid South Africa. In response, Zionists ask "Why Israel?" South African activists, Suraya Dadoo and Firoz Osman answer that question. They examine how and why Apartheid applies to the situation in Palestine by using expert academic analysis, commentaries, articles, and blogs of well-known and highly-respected activists and human rights organisations, as well as reports from NGOs with extensive on-the-ground experience in the region. The result is a comprehensive and easy-to-understand investigation into Israel's colonisation of Palestine, and its corrupting influence on the world. 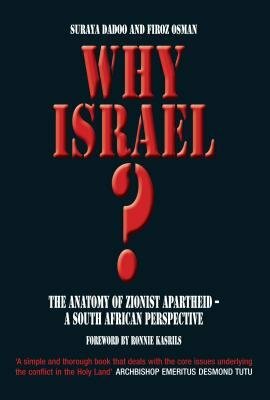 In a pioneering contribution, they also reveal how the South African Zionist lobby has been trying extend its sphere of influence within government and the media in South Africa. Why Israel? is essential reading for high school and university students, academics, journalists, researchers, and Palestinian solidarity activists - anyone wanting to fully understand the harsh contemporary realities of Apartheid Israel's oppressive occupation of Palestine. About the Authors: Suraya Dadoo is a researcher for Media Review Network. She focuses on the impact of the Zionist occupation on Palestinian media, education, health-care, and family life. Her articles have appeared in local and international publications. Firoz Osman is a medical doctor by profession and a highly-respected South African commentator on the Zionist occupation of Palestine. An executive member of Media Review Network, Osman has a special interest in Palestinian political and resistance movements, Zionist oppression, and Islamophobia.